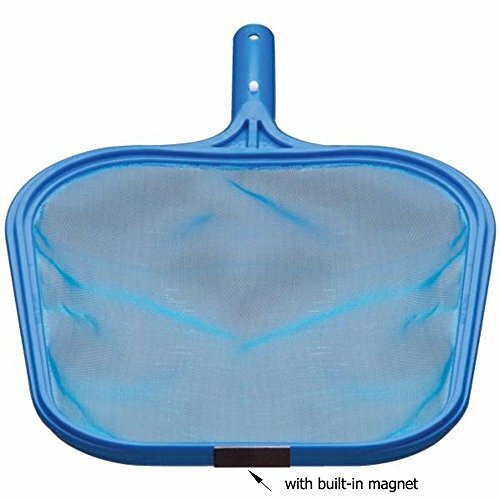 KS} Swimming Pool/Spa/Hot Tub/Pond/Fountain/Durable Plastic Leaf Skimmer Net With MAGNETIC TIP - 13 inches by 11 inches | Fountain City Art Ctr. This skimmer leaf net is designed for removing debris from pool, spa surfaces. Also Works in Fountains, Ponds, spas, Hot tubs, aboveground pool surfaces. Fits a standard 1-1/4" aluminum pool pole (not included). ➤This skimmer leaf net is designed for removing debris from pool, spa surfaces. A Magnet at the nets tip to help remove small metal objects: Hair pins,bbs,nails and more. ➤Fits a standard 1-1/4" aluminum pool pole (not included). ➤PREMIUM QUALITY: The replacement part is made from high quality material and well-tested by the manufacturer. ➤MONEY-BACK GUARANTEE: For any reason you're not completely satisfied, you can ask for a replacement or full refund, no questions asked. If you have any questions about this product by KS, contact us by completing and submitting the form below. If you are looking for a specif part number, please include it with your message.